From diaries and letters to surveys and interview transcripts, documents are a cornerstone of social science research. This book guides you through the documentary research process, from choosing the best research design, through data collection and analysis, to publishing and sharing research findings. Using extensive case studies and examples, it situates documentary research within a current context and empowers you to use this method to meet new challenges like digital research and big data head on. In a jargon-free style perfect for beginner researchers, this book helps you to:* Interrogate documentary material in meaningful ways* Choose the best research design for your project, from literature reviews to policy research* Understand a range of approaches, including quantitative, qualitative and mixed methods. 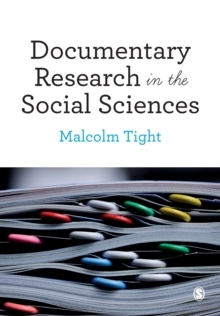 Accessible, clear and focused, this book gives you the tools to conduct your own documentary research and celebrates the importance of documentary analysis across the social sciences.